A quick stroll down South St can leave you feeling closer to Texas, where the masterminds behind Zahav and Xochitl show off their take on slowly cooked meats and hit-the-spot side dishes (hello, biscuit basket) at Percy Street Barbecue. Elevated comfort food is matched with craft beer and a cocktail list heavy on the whiskey. Try the 5lb brisket with a group and watch it carved at your table in front of your hungry eyes. Yet another of Philly’s best meals on wheels, the Guerrilla Ultima food truck is always updating its lineup of pork-centric dishes, served alongside perfectly seasoned fries and other sides. For surf 'n’ turf lovers, you'll sometimes see seafood pop up on the menu, as well as a vegetarian or vegan option. 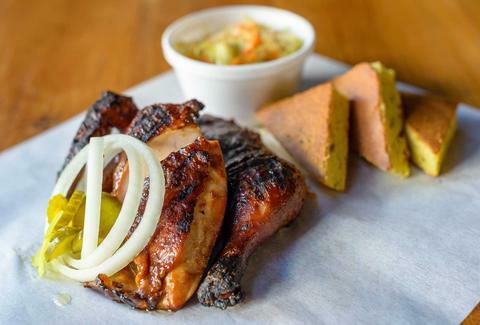 The Fishtown BBQ staple goes to great lengths to create an authentic Southern atmosphere to gorge yourself on gourmet-level barbecue from Stephen Starr. 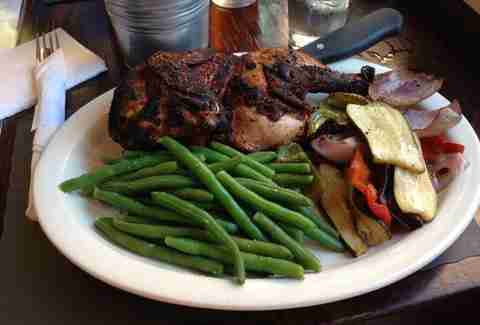 The backcountry hideaway sources its meat from local farmers. On top of its whiskey-happy cocktail menu and 10 alternating beer taps, Fette Sau also has more than 100 bourbons and whiskeys to sip on in between bites of tender brisket and broccoli salad. Lucy’s wood-burning pit gets a lot of action every Monday for the all-you-can-eat buffet (try the entire menu? Oh no, we couldn't possibly... OK, if you insist). The rest of the week, choose from BBQ classics like pulled pork and chicken, turkey breast, grits, and smokehouse chili. Opt for one of the locally loved dishes, like the Philly beef brisket sandwich served on -- what else? -- an Italian roll. Deke’s low-key setting in a spruced-up former garage is the perfect spot for observing the warmer weather while ignoring the looming bathing suit season with a brisket cheesesteak or the glorious $12 all-you-can-eat buffet. 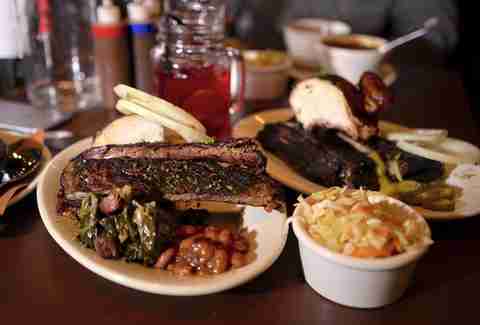 Deke’s meats are slow-cooked on hardwood coals. But the tough decisions aren’t behind you just because you settled on one of the 10 smoked meat options. You still have the sides (potato wedges? collard greens? cornbread?) to consider. When you stumble upon the Meat Wagon truck, the mixed platter is the way to go: two ribs, beef brisket, pulled pork, pulled chicken, and two sides. You could probably take the more trepidatious route and just order one of those things, in which case, see how the slow-smoked beef brisket (like, really slow -- like, 16 hours) tastes. Spoiler: it's mouthwateringly good. To get your hands on James Leggett’s Jamaican chicken is a waiting game, but there are more than enough people willing to put their patience to the test. 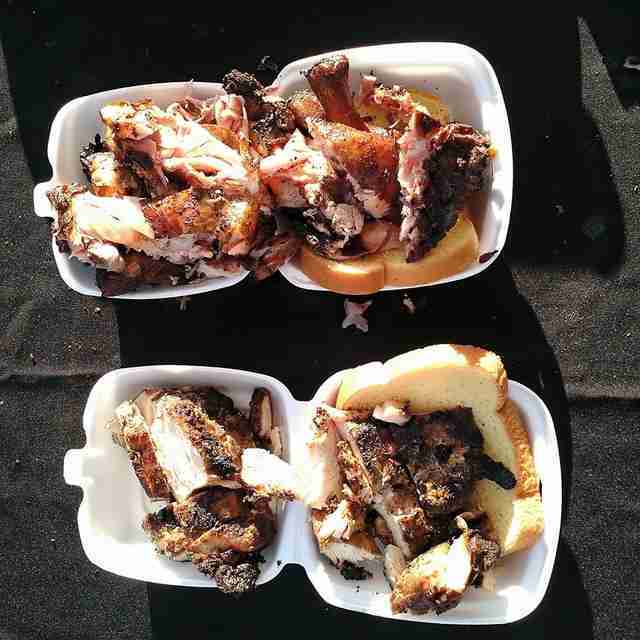 Late-night visitors to the NoLibs truck understand there is no greater feeling than the freshly warmed styrofoam on your lap as you scarf down jerk chicken wings. If late-night street food isn’t your thing (who are you? ), you can also score some of this coveted food at catered events around town. Next time you’re wandering Reading Terminal Market in search of the quintessential comfort food (and before you’re summoned back from your lunch break), make a beeline for The Rib Stand and stock up on show-stopping ribs, roasted potatoes, and mac n’ cheese. Hopefully, the constant buzz of the market will save you from the nap you now sorely need. Smokin' Betty's steps away from the typical Southern porch vibe a lot of BBQ places try to recreate. 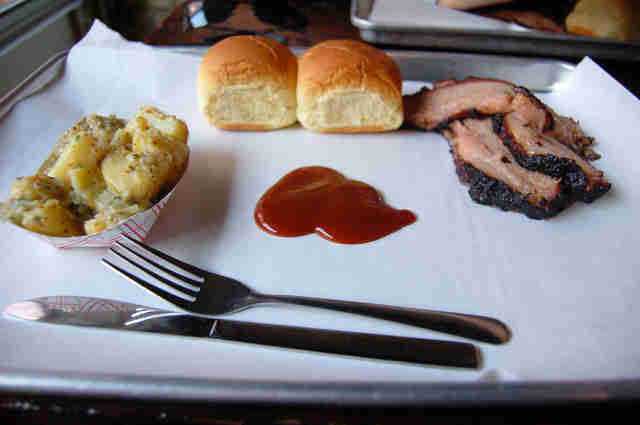 Instead, it's in a refined space on the corner of 11th and Sansom, serving a wide menu, with barbecue specialties. This means you have a few more options when it comes to traditional barbecue, like grilled salmon, with your choice of sauce and sides, or short rib tacos. That’s not to say the BBQ chicken-and-rib combo isn’t the way to go -- especially when paired with the Bulleitproof, a bourbon cocktail. Of course there’s a place in Philly that's just as much an Italian restaurant as a barbecue joint. 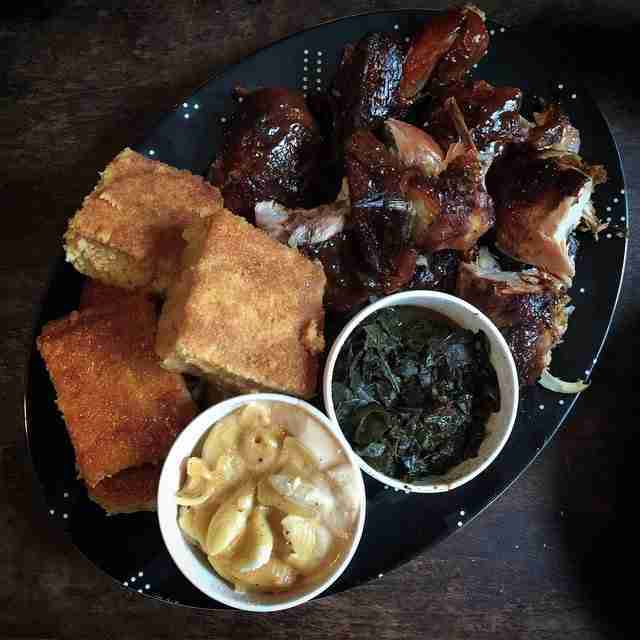 Stroll down to Bomb Bomb for one of the best ribs-and-chicken combos in town, served with fries and slaw, or opt for Bomb Bomb’s alternating steak, fish, and pork chop recipe of the day. If that’s somehow not enough to fill you up, just embark on the pasta-heavy portion of the menu. We'll get to that in another roundup. Marielle Mondon is a Philly-based freelance writer who has ruined countless T-shirts with barbecue sauce. Follower her @MarielleMondon on Twitter and Instagram.